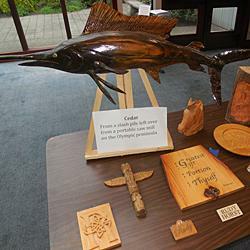 A few of the beautiful works made from locally-available woods in a display accompanying Kris's presentation. Douglas Firs and Garry Oaks—those are two varieties of trees found around Lakewood. 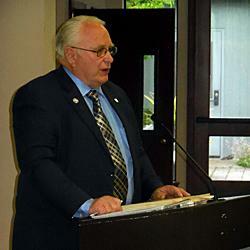 Their presence was the topic of Kris Kauffman’s presentation at Lakewood Historical Society’s April 21 meeting. 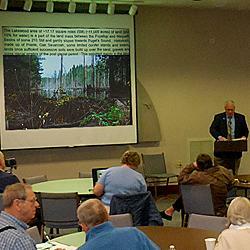 The “woods of Lakewood” was a follow-up program to Kauffman’s earlier 2012 presentation about the formation of the area’s lakes. Following the retreat of the glacier that covered the region, a vast prairie was created, and native inhabitants kept the area free of vegetation to encourage growth of berries and camas. Although there now are many tree varieties, the Garry Oak and Douglas Firs are more plentiful. Why “Garry” oak? According to one story, Mr. Douglas and Mr. Garry were both Hudson Bay Company botanists, charged with naming species of plants they found here. Mr. Douglas named the fir tree, while Mr. Garry is credited with naming the oak. A more extensive category of trees—mostly imports from exotic locales—such as the Dawn Redwood, from China, and a number of Washington “Champion” trees: the Paulona tree, the Dove Tree, the Lionhead Maple and more may be viewed by taking a walk around the grounds of Lakewold Gardens, just off Gravelly Lake Drive.